Where do you suppose did this ceremony happen? In Taiwan or in Japan? Both answers would be wrong. This private tea room is located in New York City, USA! Mr. Yasuo Koike and his wife invited Teaparker and me to their apartment in order to let us experience their (Japanese) way of preparing tea. This happened this spring, just after the events at the Tea Institute at Penn State. This was our last evening in the US, but it seemed we had already arrived back in Asia, as this tea room transported us there much faster than any plane! While the rest of the apartment is very modern and western, this traditional tea room shows the respect this charming Japanese couple has for tea and its traditions. 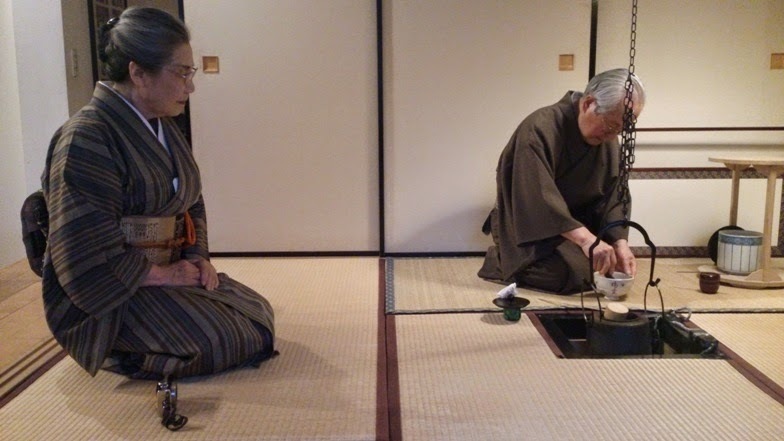 I should note that Ms. Koike is a Japanese tea instructor from the Omotesenke school. And her husband is now her student! So, she was supervising her husband and instructing us how we should proceed at each step. If you attend such a ceremony for the first time, all these rules may seem very awkward and rigid. 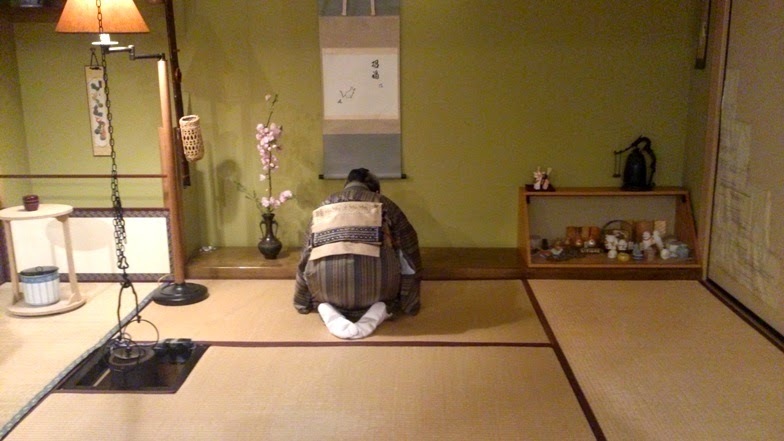 Why bow in front of a calligraphy? 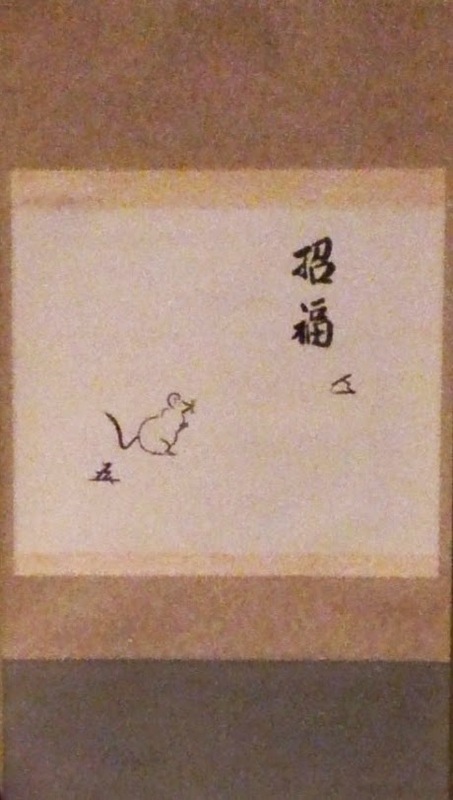 A calligraphy of mouse?! This tiny animal represents joy, happiness. But beyond the symbol, this calligraphy also has a value, because it was bestowed to them by someone with a high rank in Japan's tea community. It's not a painting that you can buy with money, but one that is earned through your accomplishments (like teaching Japanese tea in NYC for several decades). Respect for the master and the teaching is essential for the student to learn. 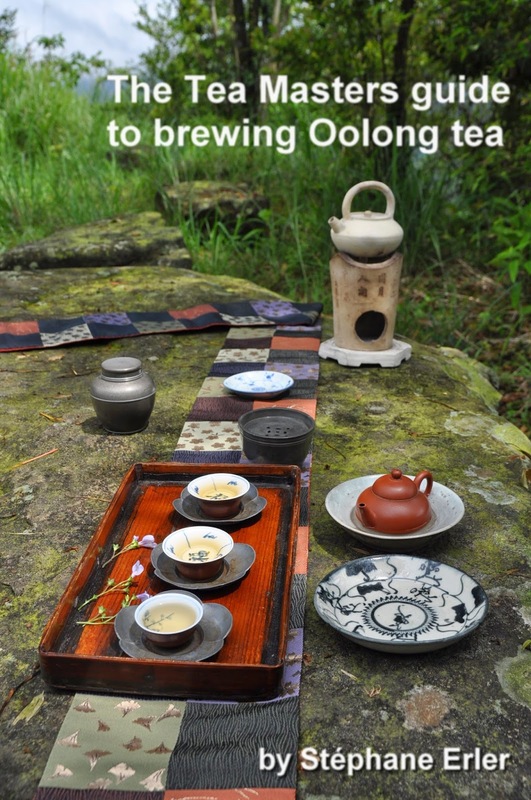 In the West, we may feel the rigidity of the Japanese tea ceremony stifles innovation, because you're not thinking outside the box. But in our urge to be innovative often becomes an excuse not to learn the traditional technique in depth. My belief is that great innovation only happens after you have mastered the tradition, not before. 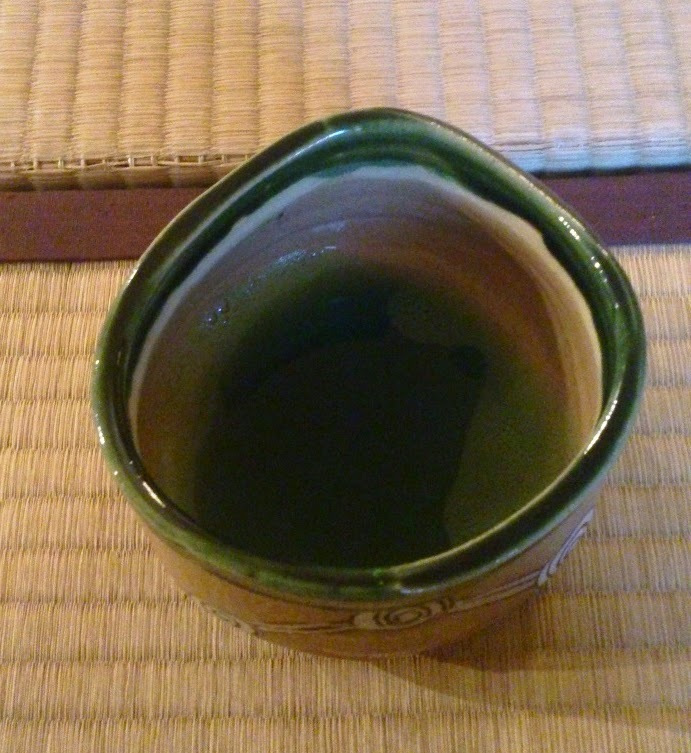 The matcha tea ceremony originally comes from the Sung dynasty and it's very difficult to perform this technique well. So, from my experience, the rigid steps of the ceremony are a good way to guide you through each moment and to make you pay attention to what you're doing. There's a reason for most of the steps. For instance, you are supposed to turn your bowl twice by one quarter. That's because ancient bowls were not perfectly round: they had a front side, a place that was best suited to drink from. Looking for and find this perfect place is what this turning of the bowl is about. After a long day of visiting the Met, this tea and these sweets were the perfect combination of art, beauty and pleasure for body and mind! 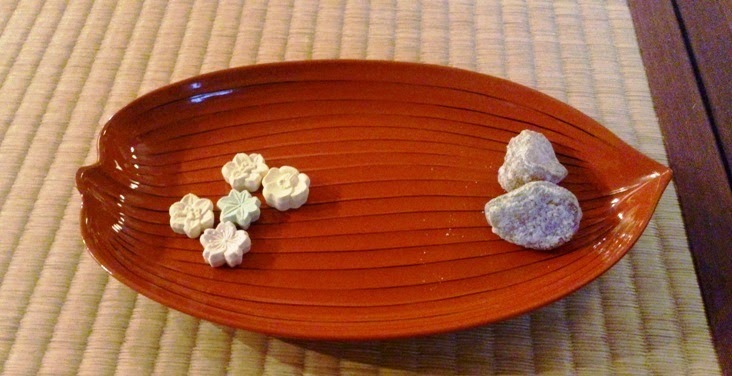 Everything was there: even the sweets from Japan looked and tasted delicious! 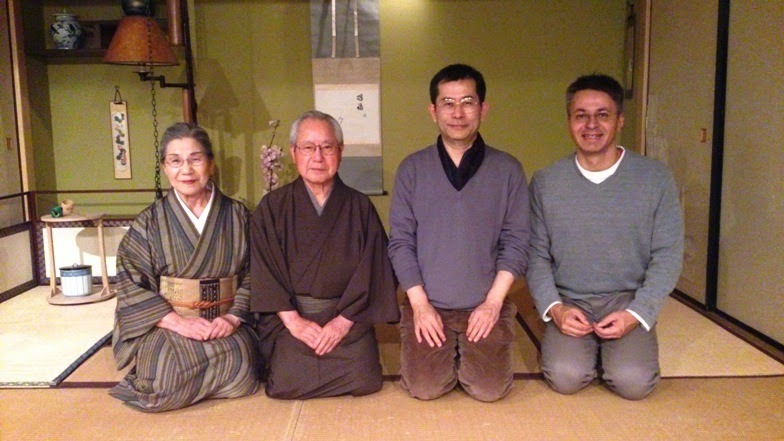 Thanks again Mr and Ms. Koike for the wonderful evening and this special Japanese tea experience in NYC! The formality of the event helped engrave it in my memory. 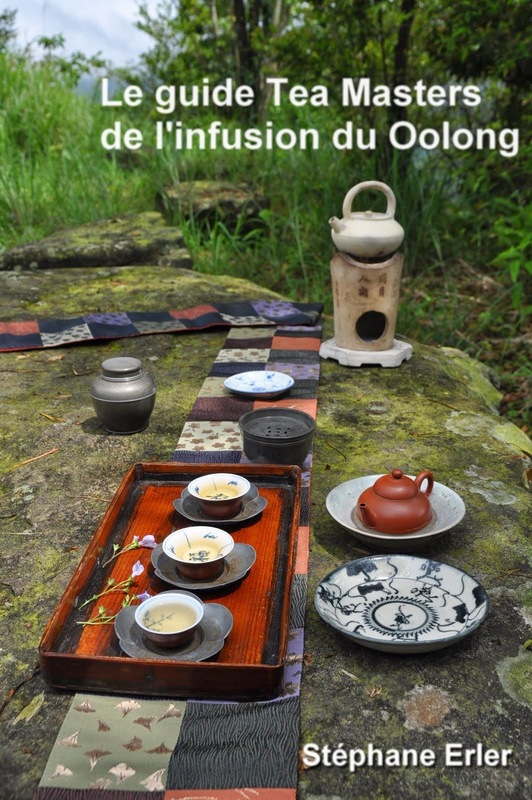 This is also an interesting subject to develop some other day: how to make each moment in tea/life special? 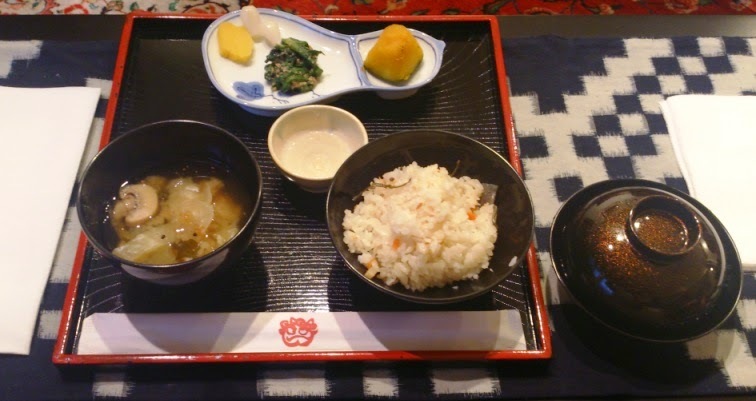 And thank you also for the traditional meal concluding our tea ceremony!